No, I haven't taken leave of my senses and decided to review the execrable Michael Keaton holiday vehicle about a snowman possessed by the spirit of an absentee father that was yet another nail in the coffin of Keaton's career. 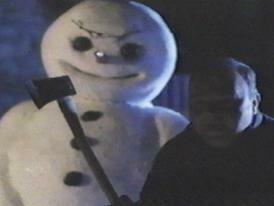 This is the other mutant snowman holiday flick. The good one. Coming out the year before the sentimental crap with the similar name, this Jack Frost follows the adventures of your typical serial killer who one day has the misfortune to encounter a mutagen that gives him superpowers. Sounds kinda like your typical superhero/alter ego story, but this one has a couple of twists, not the least of which is it's the bad guy who gets the superpowers. Oh, yeah; he also gets turned into a snowman for his trouble. The foundation for the story is simple. An especially vicious serial killer - because you never see just your ordinary, garden-variety serial killer in horror films - has finally had his reign of terror ended by a small-town sheriff, who happened to catch him just after he'd claimed a local as one of his victims. The sheriff was, of course, instrumental in getting the killer convicted - because if he hadn't been, we wouldn’t have a film - and is - also, of course - haunted by what he saw at the crime scene and by the taunts of the killer in the courtroom about retuning to exact vengeance on the sheriff and everyone citizen of the sleepy little town that became the killer's Waterloo. As the sheriff nervously counts down the hours to the killer's execution, the killer is being transferred from the prison where he was being held to the place where the state will exact justice - because, of course, the story conventions of escaped criminals wreaking havoc dictate that the criminal in question never be incarcerated where he is to be executed - and the prison van has an untimely meeting with a truck carrying some kind of toxic something-or-other, which conveniently sprays all over the killer, effectively melting him (in a really cool effect, by the way). The prison guards shrug it off as the taxpayers being saved the expense, while everyone else in the film breathes a sigh of relief that the mad-dog murderer has gone on to a higher court. And now the film really takes off, as we the viewers witness the birth of the wittiest supernatural psycho-killer since Freddy Krueger first started slaughtering the adolescent inhabitants of Elm Street. Which in this case, turns out to be a good thing. Since the creation of Freddy, wisecracking psychos have seemingly become de rigeur; they've also become the bane of spook-movie fans' existence. It seems every mad-dog killer these days has to attempt witty repartee, most with absolutely dismal results. It takes a certain kind of panache - not to mention excellent writing - to effectively quip whilst eviscerating the innocent. Robert Englund has a special gift for that sort of thing, and thankfully for Jack Frost, Scott MacDonald also shows a rare talent for tossing off one-liners during dismemberments, making his rampaging killer snowman all the more enjoyable. And so the stage is set for the showdown between good and evil, as the sheriff sees his recurring nightmare come to life, albeit in the strangest manner. And since Jack Frost is now a snowman, no one believes the poor, beleaguered lawman when he tells them this is really the guy they all think was melted by chemicals. Well, not until a goodly number of the citizenry is slaughtered in cool ways. Of course, the lawman eventually prevails, and poor Jack is vanquished in a unique and surprisingly logical manner. Far be it from me to reveal how folks are offed, or what finally awakens the rest of the town to the danger, or whether or not Jack Frost is really gone. What I will tell you is that Jack Frost is one of the best slasher flicks to come down the pike in many a year, and actually manages to find a few new ways to bring lives to an untimely end, no mean feat given the number of films in the genre. And Jack is certainly a worthy successor to Freddy Krueger, every bit as funny, and scary, as our favorite inhabitant of nightmares. An evening spent with Jack Frost is a marvelous way to pass just-shy-of-90 minutes of your time. And you might think twice before building that cute little snowman in the yard this Christmas.